As we begin to get ready for our upcoming cruise, I realize how much I hate packing! 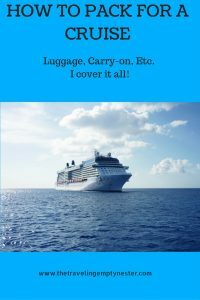 But for those folks who have never been on a cruise, I thought it might be helpful to create some lists of what and what not to pack. Once you arrive at the port, your luggage will be taken by porters and you won’t see it again until later in the day in your cabin. 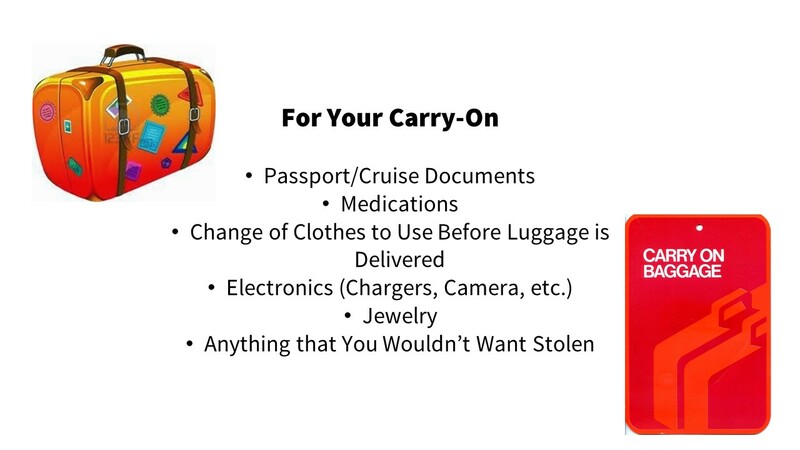 Pack a carry-on that includes items that you’ll want with you before your luggage arrives. You might not get your luggage until after the ship leaves port, so keep that in mind as you pack. As you begin to think about which clothes to bring on your cruise, take a look at your schedule for each day. That will help you plan your wardrobe. Lay out all the clothes you plan to take. Now put half of those clothes back. That should be accurate! Plan your wardrobe so that you can mix and match your clothes. It really is okay to wear things more than once! No one will know or care, I promise! There are days when I’ll wear something for an hour or two before heading to the pool or dinner. You better believe I’ll re-wear those clothes! I also like to bring a sweater or pashmina because I’m one of those girls who are cold all of the time. Even in the Caribbean. Irons and steamers need to stay at home. Hair straighteners and curling irons are totally fine! Candles should be pretty obvious, but I do like bringing battery operated candles for those cruises when I have a nice balcony. To pack a lot into one bag and avoid those wrinkles, I roll my clothes for maximum space. Also, Downy Wrinkle Releaser works miracles! Seriously, I spray a light spray on any wrinkles and pull or flatten my clothes to work the wrinkles out. It also has a nice, fresh smell! 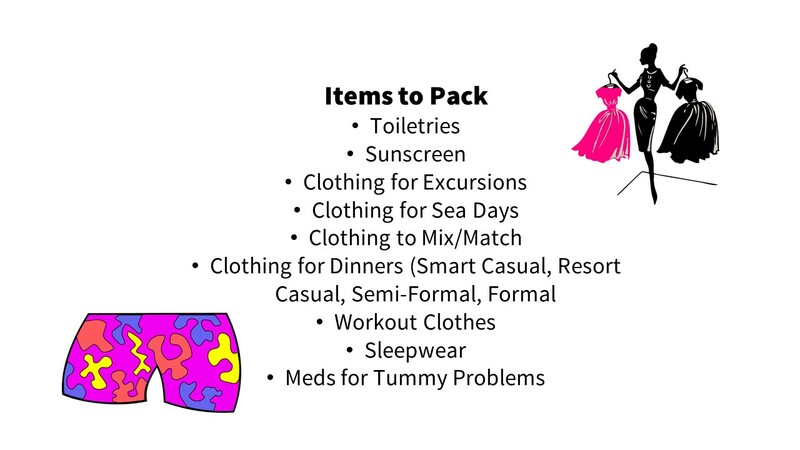 Do you have any packing tips you’d like to share? Let’s hear ’em! If it’s a long cruise (more than 7 days) some ships have washer/dryers. Bring travel size detergent and dryer sheets. The laundry room sells them but are expensive. We went on a 10 day Hawaiian cruise & planned extra days in Oahu & San Franscico & doing laundry was a must. 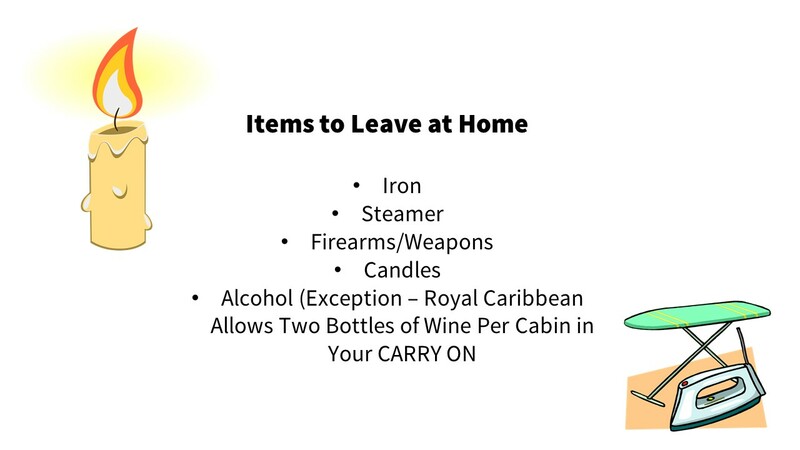 Also most ships allow you to bring 1 case of sodas per person. If you are flying in the day before cruise leaves (which I highly recommend) you can buy them at local store. Great tips! You can usually bring water bottles, too. Just put a luggage tag on either the soda or water bottle case.